The engineers at Strix needed to be able to remove the die lifters quickly once the tool had been positioned in their Bruderer press. They needed the T slots for clamping purposes. Die Lifters and Rollers are not all the same..! Some are spring loaded where they are in the up position always supporting the tool until they are clamped down into position. 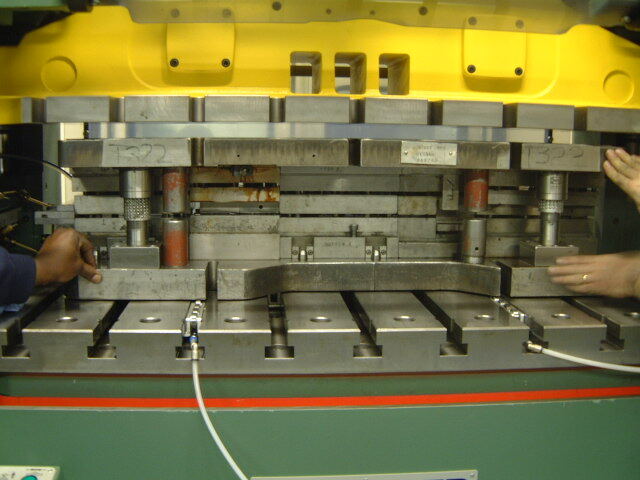 Others are hydraulically powered, which provide a very high lift capacity (much more than is required for many tools) but have the disadvantage of hydraulic pipework around the press table, which can be damaged during tool changing and can be an incumbency for sliding clamps into T slots. Using the Premitec pneumatic system, made it a quick, clean process. Strix engineers simply disconnected the air supply to the lifters and disconnected the quick Pneumatic couplings to the die lifters. The lifters were then simply slid out of the T slot and put to one side, thus allowing ample T slots to be used for clamping of the bottom bolster of the press tool. Once the tool was in position, the air in the die lifter is exhausted and within second the bladder bag under the die lifters lowers allowing the die lifters to be slide from under the tool. The air line is simply disconnect using a quick release connection. The die lifters can then be used on other presses. One pair of die lifters for a whole press shop..! The pneumatic die lifters have been used in tool handling outside the press to delivery press tools to the rear of the presses when required – view the video footage on this page. Instead of changing tools with a fork truck when required throughout the shift, the tools are loaded onto the racking system behind the press at the beginning of the shift. The operator can then pull/push tools in and out of the press from the rear without the need of the fork truck or fork truck operator, so reducing production downtime. One operator can certainly move tools up to 3,500kg and two operators much more. Click below to subscribe to our newsletter and product update email.